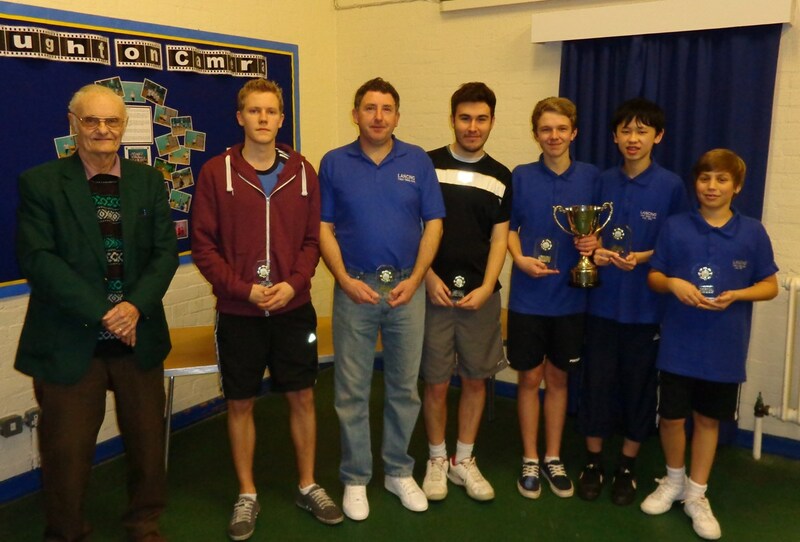 Lancing F from Div.3 cruised to a 445-363.5 point victory over Lancing C from Div.1 in the President’s Handicap Cup final staged by the Lancing Table Tennis Club at North Lancing School. The winning team of Sam Hall, Lim Tang and Tom Miles, all juniors, played some very impressive hard hitting table tennis to overcome their more experienced opponents, Dave Churcher, Tom Tobias, and Juri Hiltunen. Twenty-four teams had entered the competition at the start of the season, which is run on a knock out basis. Every point won during the course of a match is added to the teams running total. In addition to this handicap points are awarded to the lower division player based on his standing in the league averages. In the first game Juri Hiltunen beat Sam Hall 3-1, but on handicap Sam had put his team 8 points ahead. A very impressive performance by Lim Tang in game two against Tom Tobias ended 2-2, and with a gain of 19 points extended his teams lead to 27 points. The third game saw the experienced Dave Churcher up against Tom Miles, the youngest player in the match. Dave won 3-1, but on handicap Tom gained 3 more valuable points for his team. The overall match score at this stage was 152-122. It was Tom Tobias up against Sam Hall in the fourth game, and another impressive 2-2 result from Sam gained 23 points for his team, increasing their lead to 53 points. Next up it was Juri Hiltunen against Tom Miles, and although it was 4-0 to Juri. Tom still gained 1 point for his team increasing their lead to 54 points. Dave Churcher v Lim Tang was another impressive 2-2 score line with Lim adding a further 14 points to the team total bringing it to 68. An expected 4-0 win for Tom Tobias over Tom Miles came in the next game, bringing the C team their only win on points during the match. The 6 points gained reduced the lead of the F team to 62. Dave Churcher was next on against Sam Hall. Yet another 2-2 resulted with another 9 points being added to the F team score. The final game was Juri Hiltunen v Lim Tang which Juri won 3-1, but Lim still gained 11 further points bringing the winning margin to 81 1⁄2. The 1⁄2 point being awarded to the C team, on the toss of a coin, to prevent a draw occurring.